Earth Day is an international event that’s held in honor of environmental protection, a topic that has been extremely controversial in the United States lately. I remember making dioramas and potting plants in elementary school, but somehow its celebration got lost throughout adulthood. 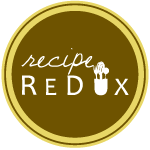 This brings me to this month’s Recipe Redux theme: Easy Ways to Reduce Food Waste. In honor of Earth Day, ReDux members were challenged to show how they reduce food waste. Whatever we would normally toss, they wanted us to use it up. And that’s exactly what I did for this recipe! In college, two men in my dorm decided to do their own food waste challenge. They started eating the peels of all fruits and vegetables they bought. One day I walked into their room, and I saw one of them eating the entire orange, starting with the peel. It was pretty incredible. You see the “orange” in the title? Well, these boys inspired me. For this recipe I used the entire orange, peel and all! There are endless opportunities to use all the ingredients in your home. Reduce your garbage footprint. No time (and food) to waste! Make the crust. In a medium bowl, mix the flour, sugar, and salt together. “Cut in” the butter. Cut the butter into small pieces. Use a pastry cutter or your fingertips to blend the butter into the dry ingredients. Blend just enough so that the crust looks like breadcrumbs. Grease a 9 x 9 inch baking pan. Flatten the crust onto the bottom of the pan. Place the pan in the oven for 15 minutes, or until the crust becomes golden on top. While the crust is cooking, make the filling. In a food processor, blend all the ingredients until smooth. Make sure the orange peel is fully blended into the ingredients. The filling will be very watery. Once the crust is done cooking, take it out of the oven. Add the filling, and place the pan back in the oven for 15 minutes. Remove the bars from the oven, and let them cool on the counter for an hour. Slice and decorate as you like! These bars are SO delicious and refreshing. You won’t even believe that you used the whole orange! You’ll not only feel proud of yourself for eliminating food waste, but you’ll also give yourself a pat on the back for making these show stoppers. The saffron gives a very unique flavor to this recipe. But please try the recipe without the saffron, and let me know how it tastes, please!